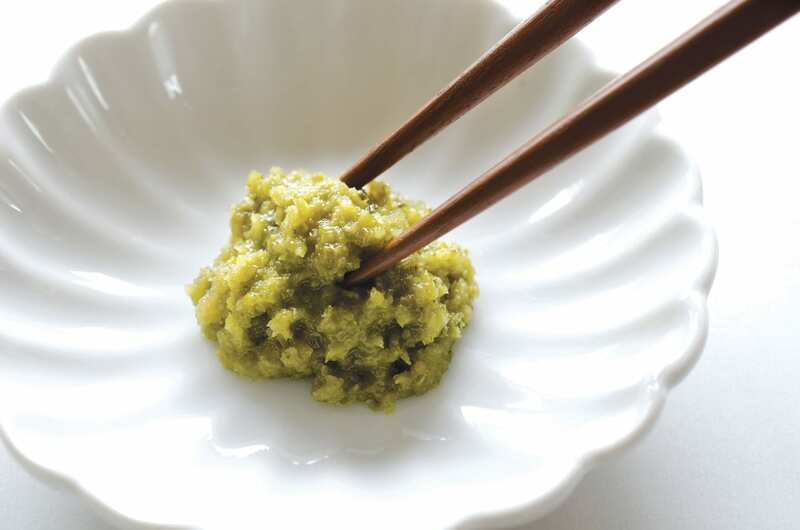 Yuzu kosho is one of the most commonly found condiments in the southwest of Japan, on Kyushu island. It is a paste made out of chilli peppers, yuzu peel, and salt, then allowed to ferment. Green chilli peppers are more commonly used in the mixture, though red ones are also a viable option. There is not much literature on the origins of yuzu kosho, but it’s believed to have originally been made in Hita, Oita prefecture, as well as Soeda, Fukuoka prefecture. These are areas that have had a long history of yuzu cultivation. Another story goes that Mount Hiko, a sacred mountain located between Fukuoka and Oita, had a yuzu tree, which inspired a yamabushi (ascetic hermit) to create the first yuzu kosho. Spicy and tangy, it’s little wonder that yuzu kosho is a great condiment to add to stews and soups that are often served up during the cold winter months. It’s also eaten with miso soup and sashimi. However, due to the growing popularity and ubiquity of this condiment, its uses have vastly expanded, and can be used with dishes as diverse as yakitori and tempura. It even adds an unexpected yet pleasant twist to western-inspired dishes such as pastas and salads. As this amazing condiment only requires three ingredients, you can even try making it yourself at home. First, mince three bird’s eye chillis after carefully removing its seeds. Next, place the minced chilli, along with grated yuzu peel, and a teaspoon of salt together in a mortar and pestle, and pound until it becomes a fine paste. Then, slowly add yuzu juice until it’s a consistency of your desire. Experiment with making pasta using yuzu kosho as a sort of pesto, or even rubbing it onto fish before grilling. The salt in this mixture acts as a preservative, so it can keep for a month in the fridge, or longer if you freeze it.